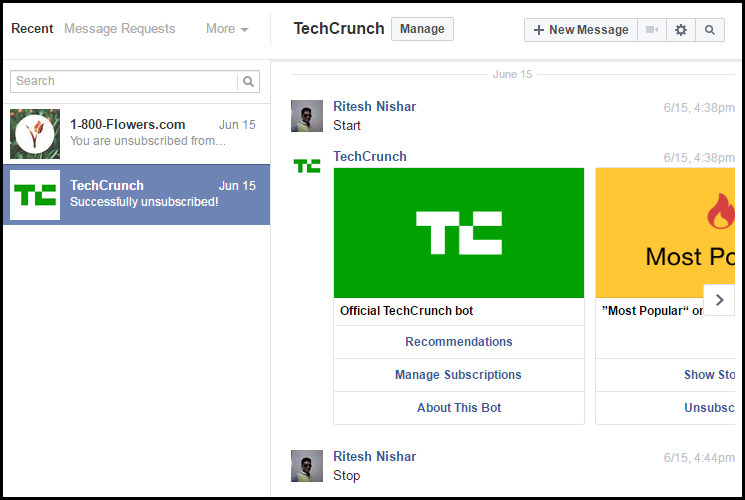 Looking for an offline record of your Facebook chat messages? Earlier it was cumbersome because in order to get a copy of your Facebook chat messages, you had to request for a copy of whole of your Facebook profile data. Once you request, Facebook sends it to email and then you had to extract your messages using any zip extractor. The messages’ file that you get along with this requested copy shows conversation with multiple people. What if you want to get it with only person that you chatted with? Well, there is a simpler way to do this now. Lets see how. In order to download Facebook chat messages to PC, you will have to use Google’s Chrome browser. So follow these following steps once you have Chrome ready on your PC. Step 1: Login to your Facebook profile and open a conversation from Facebook message inbox. Open conversation as shown in the image below. Step 2: Add an extension called Messages Saver for Facebook™ from this website. Step 3: Right click on the extension icon and choose options. Choose the file format and style. The best option is to choose HTML format. However, you can choose any from text, csv and zip format too. 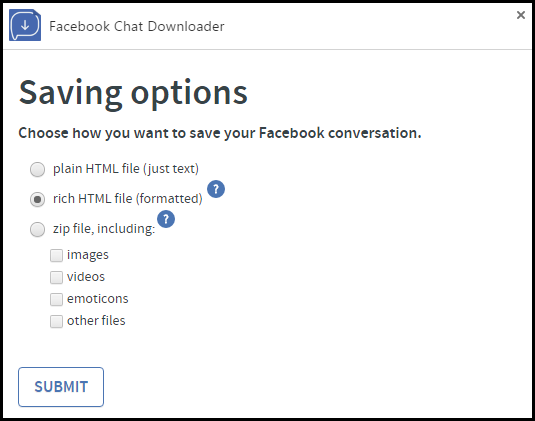 Style option can be used if your are downloading Facebook chat conversation from Messenger.com. Step 4: Go back to Facebook conversation that you have selected and click the extension button. 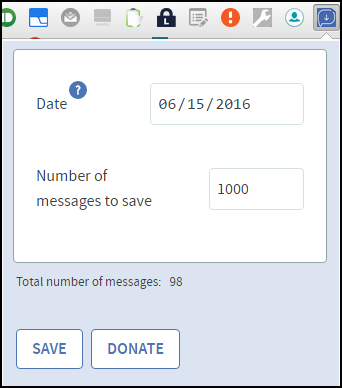 Step 5: Select the first and last date of the messages. Once you hit save, all the messages between these dates will be saved. It also shows the number of messages. It will download a html or a zip file depending on the option that you have selected in step 3. The plain file looks cluttered and the zip file does not show links properly. For the best results, you can select rich html file as it includes media attachments and links too. Open the downloaded html file using Chrome browser and it will show the Facebook conversation that you have selected. Now, you can either keep it as it is for offline record or you can print it for physical record. Lets see how you can print it. Step 1: Open the downloaded html file in Chrome browser. Step 2: Right click on the page and choose to print it. This method of downloading and printing Facebook chat messages is much convenient than the traditional method. You can get a copy of your downloaded chat messages in fewer steps and also readability of the downloaded file is good. All your media attachments like photos and videos stay as it is. You can also click on the links while you are connected to the internet. Neither the Facebook desktop site nor its messenger app allows to email conversation like WhatsApp. It does not even allow to download the conversation directly from the Facebook message inbox. So this method is feasible.